IT’S the most wonderful time of the year once again, when the mood is merry, people are happy and the smell of roast turkey is in the air. The treats are sweeter than before. Christmas and New Year’s Eve are just around the corner, and F&B retailer The BIG Group has some delectable delights in store this month. The group is sticking to its ideology that food brings and ties people together, and all month long, its Ben’s, Plan B and Ben’s General Food Store outlets will feature a sumptuous spread of seasonal delights for everyone. The three-course menu at all of the eateries is designed to get everybody into the festive mood. The menu starts off with a fusion of flavours with the smoked salmon terrine and arugula salad. For the main course, stuffed turkey rolls with sweet chestnut cranberry stuffing, with sides of grilled broccoli, hasselback potato and caramelised shallot gravy. End your meal on a high note with the classic red berries pavlova, topped with strawberry ice cream, red berry coulis and pomegranate, all of which will definitely electrify your palate. 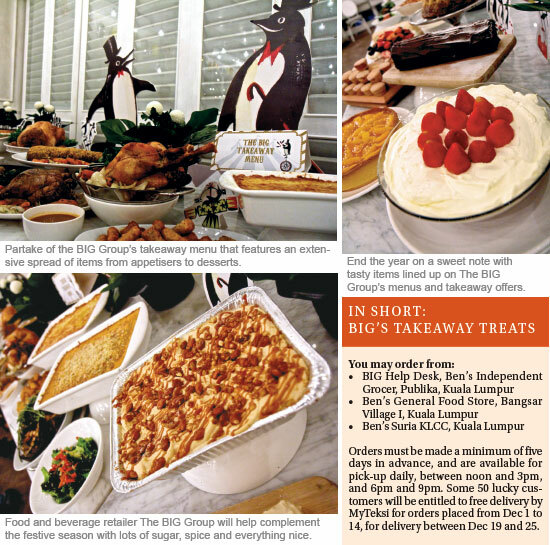 If you are planning on hosting a Christmas dinner at home and are running short on time to prepare food, Ben’s Independent Grocer (BIG) at Publika will come to your rescue with a special takeaway menu. Their specially prepared and succulent roast Christmas turkey served with cranberry jam takes centre stage on the takeaway menu — an item that is not be to be missed this festive season. The dish that comes with other condiments as well will be available for pre-order and collection throughout the month of December. The BIG takeaway menu features an extensive spread of items from appetisers to desserts that are fuss free and will give you more time to spend with your loved ones during the festivities. Starters featured on the takeaway menu include chicken liver pate and Melba toast, hummus dip and cold prawn and cocktail sauce. Aside from the roast turkey, customers can also order main course dishes such as the herb crusted beef tenderloin, stuffed leg of lamb and quiche Lorraine. Seasonal classics such as Brussel sprouts with chestnuts and beef bacon, rosemary garlic roast potato and rosemary garlic roast pumpkin also make an appearance on the takeaway menu. The dessert spread includes festive favourites such as mince pie, red velvet log and chocolate bread and butter pudding — a grand finale for an already impressive menu. All customers have to do is place their order ahead of time and set a collection date for the food to be picked up. The newly opened Ben’s Bake Shop, inside Ben’s Independent Grocer, will satisfy anyone’s sweet-tooth cravings. Located in between Plan B Roasters and B’Wiched you will not miss Ben’s Bake Shop, with its bright lighting and dazzling display of desserts. Diners at Plan B Roasters and B’Wiched can order items from Ben’s Bake Shop to be sent to their tables. With its white round tables and pale green stools, you will feel like a child at a birthday party full of sweet delights. Only desserts such as the klonut, purple kaya toast and newly improved éclairs will be making a yummy appearance at Ben’s Bake Shop. Other unique treats from Ben’s Bake Shop include the Thai crème brulee, sweet & sour baked Alaska and the cheese platter for anyone looking to try something different. With all these tasty items lined up on The BIG Group’s menus, it is also a time for us to be thankful and to appreciate life’s blessings, making it the perfect way to spend time with your loved ones as the year ends. For more information, see www.thebiggroup.co or check out www.facebook.com/TheBigGroup.